One of the most satisfying aspects of growing succulent plants is their propagation to share with others, as raffle prizes and for the sales table. This is one of the few situations where you can get something for nothing. Propagation of rare plants helps to make them more commonly found in collections, which should help to reduce pressure on wild populations. A range of easy techniques can propagate most plants including succulent species i.e. cuttings, division, offsets, grafts, cross-pollination and raising from seed. Eventually, it will be found that propagation is so easy that space, materials and time become the limiting factors. Cuttings - something for nothing ! Taking cuttings is a fast way to produce new plants which are genetically identical to the original specimen. As there is no genetic diversity among plants propagated from cuttings or by division, any desirable traits are preserved, but any faults such as susceptibility to disease are also faithfully reproduced. In species which are self sterile, it will not be possible to raise seed by crossing two individuals which have been propagated vegetatively from the same clone. Many species of succulent plant can be propagated from pieces of plant stem cut with a sharp knife. Knives and other cutting tools used for propagation should always be sterilised by dipping in methylated spirit or by heating. The best place to cut is just below a stem joint, or where a leaf or bud joins the stem, taking care to remove cuttings so as to not spoil the plant's shape. It is usually best to try to arrange for the cutting to have at least one more stem joint higher up. Ceropegia stem cuttings work well if taken as pieces with two pairs of leaves. Any leaves should be removed from the bottom stem joint, but it is counter-productive to rub off buds in leaf nodes. The stem cutting should be potted up in a heat-sterilised gritty potting medium, pure sharp sand, fine grit or vermiculite. In some cases, cuttings can be potted up immediately after cutting, but I usually allow the cut end to dry for a day or two to let the damaged tissues to seal, reducing the chance of fungal attack. You may want to experiment with potting up cuttings both ways. It may help to dip the cut end in some hormone rooting powder, particularly as the powder also usually contains a fungicide. A single leaf, carefully detached from many succulents is often sufficient to start a new plant, and is the preferred method for propagating e.g. Adromischus, Crassula, Echeveria, many Kalanchoe, Sansevieria and many epiphytic cacti. Leaf cuttings can not be taken from Dudleya despite their similarity to Echevieria. It is possible to propagate Gasteria from a piece of a leaf. The leaf is allowed to dry for a few days for basal tissues to seal and callus over and is then placed against the edge of the plant pot with the stem end touching the potting medium. I find that this is better than burying the base of the leaf as it is less likely to rot. After some time roots will be seen to form, followed by small leaves as the new plant starts to develop. Cuttings are best taken at the beginning of the growing season, usually in the Spring except for those plants that grow during the Autumn or Winter. The cuttings should be kept in a well ventilated bright place at about 20°C, but not exposed to direct sunlight which places the cuttings under too much stress. It is a good idea to keep cuttings in an propagator with a top to retain humidity until they have become established. Alternatively, the pot can be placed inside an inflated polythene bag or the top half of a clear plastic bottle can be placed over a suitably sized pot as a make-shift propagator. Leaf cuttings should be watered sparingly until some new growth is seen, which is usually an indication the some roots have developed. Many species of succulent plant form mats or clumps or thick tuberous roots and may be propagated by division. The plant is removed from its pot and as much of the soil as possible removed. The method of division then depends on the growth habit of the plant. Some succulent plants (e.g. mat-forming Asclepiads (left), Crassulaceae, multiheaded cacti) disintegrate to a handful of cuttings as soon as removed from their pot. Good pieces with roots can be selected and potted up individually. 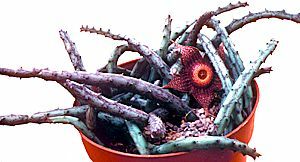 If the goal is to raise a large specimen of this type of plant, either repotting must be very gentle or the cutting started in the desired final pot size. In other cases a thick tuberous branching root will be revealed and this can be divided with a clean knife into two or more pieces. Each piece should be selected to have growing points and vigorous roots. This sort of division is best carried out while the plant is dormant and dry, or it may be weakened by excessive bleeding of sap. Cut surfaces can be dusted with a fungicide such as Benlate or flowers of sulphur and allowed to dry for a few days for the tissues to seal and callus over. Each piece can then be potted up separately in a gritty potting compost and watered very sparingly until some new growth indicates production of new roots. Many species of succulent plants and cacti produce small plants at the base of the parent plant. These offsets can usually be easily pulled or cut from the main plant, allowed to dry for a few days and potted up individually. The main plant benefits from removal of offsets which can divert energy from the main stem, and removal of offsets may be essential to the production of a large solitary specimen. Other species produce minature plants on the edges of leaves, flower stems or flower heads, and these can also be removed and potted up. Grafting is a method of providing a delicate, cristate or monstrous cultivar with a hardy, vigorous rootstock. 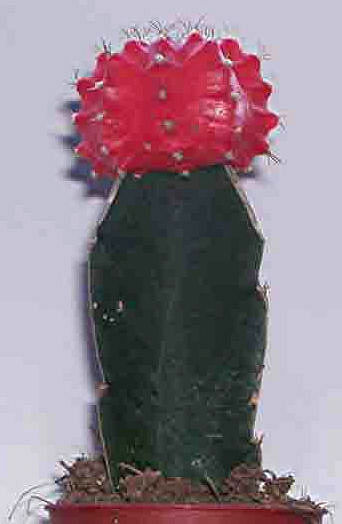 A variety of brightly coloured, but photosynthetically incompetent cactus cultivars, are commonly propagated by grafting in the horticultural trade. Grafting is the only way of ensuring the survival and of propagating these natural sports. Several grafting configurations are used, depending on the material to be used. Strict attention to hygiene is essential and cutting implements should be sterilised by dipping in methylated spirits. For Asclepiadaceae -- Ceropegia tubers e.g. C. woodii. Flat Grafts are probably the simplest system for a beginner to attempt, and suitable for plants with fleshy stems such as cacti. The stock is first cut flat with a single clean cut with a sterile scalpel balde, razor blade or very sharp knife at a suitable height, usually above soil level. The material to be grafted (scion) is then cut cleanly across and the cut surface placed on top of the cut stock in such a way that at least part of the vascular elements on both pieces are in contact. The graft is held in place with an elastic band which goes under the bottom of the pot at its other end. Side Grafting is a variant of flat grafting used for relatively thin material in which the stock and scion are both cut at an angle to increase the area of cut stem and increase the chance of the vascular elements making contact. Split Grafting is another method used for thin material, in which the end of the scion is cut into a wedge shape and inserted into a "V" shaped incision in the stock. The stock is then bound tightly with cotton to hold the two parts together.